Setting and trying to achieve OKR's and KPI’s is done in every company but as Culture is leading at Helloprint we didn't want to go down with the standard in this discipline. 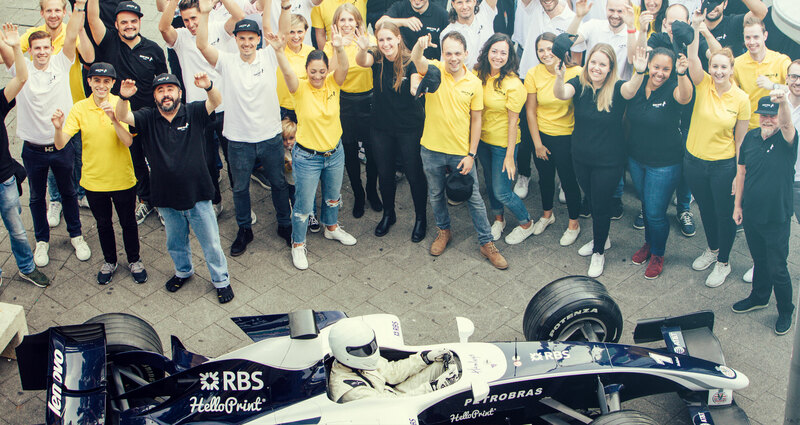 For Helloprint sports and speed have always been an interesting combination to motivate our teams and are actually part of our set of core values. Companies as Mercedes, Ferrari and Red Bull have been a huge inspiration to us performance and branding wise. Hello Prix, our latest season theme is all about speed, craftsmanship and team building. After the previous Hello-X theme it wasn't easy to come up with a more appealing theme as gamification for our company targets. With Formula 1 and a full VIP Paddock weekend at the Grand Prix of Barcelona for the winning team we think we managed to live up to fine Helloprint standards once again. Eventually our Customer Service team Benelux (located in Valencia and our biggest team) won the season event. They will be going to Barcelona with a fine group of 35 people. Enjoy the closing and opening ceremony here and make sure to apply at jobs.helloprint if you think you should be part of the perfect machine.